When the American consular officer called his name, Irakli felt chills down his spine. This was it, the moment he had been preparing for so long. He had been declined a U.S. visa once before, but this time he was ready: he came with a fake proof of income, a fake employment letter and a fake wife. Getting a visa to the U.S. had long been an idée fixe for Irakli, a 40-something Georgian. He saw it as a ticket to a new world, where he would start over, where his musical talent would be properly appreciated and where – with luck – he would hit it big. Contrary to what his application for a B2 tourist visa claimed, Irakli was unemployed, single and planned on getting a job in the U.S.
To detect potential security threats and illegal migrants, the U.S. consular service runs extensive background checks on visa applicants. Checks are run through the databases of various U.S. government agencies; partner governments’ records can be consulted as well. If no red flags pop up, it ultimately falls to the consular officer to make the call about the real intentions of the person at the window: does the applicant really plan to return to Georgia, or is he or she going to the U.S. with the intention of staying illegally? The officers also learn about economic, social and immigration trends, as well as fraud strategies in the countries where they work. Still, they often lose the poker game with the person at the window. “People still fool us, we are not mind readers,” Rebert told Eurasianet. 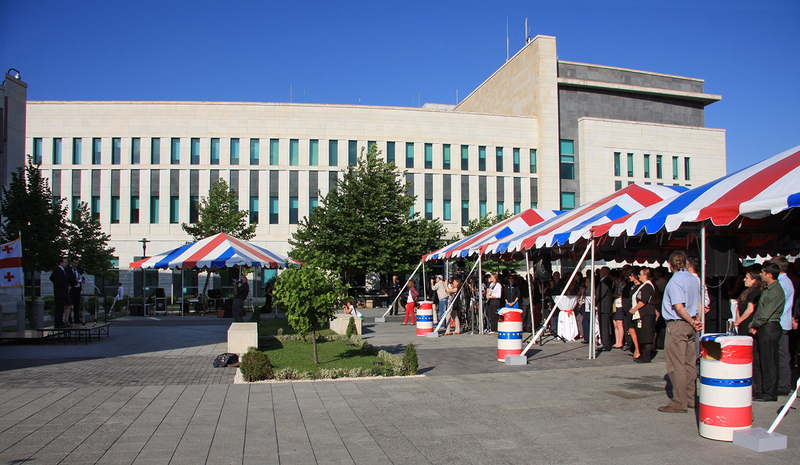 In fact, hundreds of Georgians fool the U.S. consular service every year. More than 9 percent of Georgian visitors, 603 individuals, overstayed their tourist visas in the U.S. in 2017, according to a Department of Homeland Security report. The rate, although a decline from 14 percent the year before, is still the highest for any country in Europe or the former Soviet Union. For Georgians like Irakli who want to sneak into the U.S., there is a network of informal visa brokers in Tbilisi who coach and prep them. They maintain a degree of secrecy about their work and tend to only accept clients suggested by friends and acquaintances. But Irakli, when I met him at a party a year ago, was telling everyone about his plans to get to the U.S. with the help of a visa fixer. An ebullient type, he flitted from one group of people to another, quickly losing interest in any conversation that did not center on him. He agreed to let me follow him through the process so long as I didn’t disclose his real name, the musical instrument he plays and other details that might compromise his identity. “You will have an exclusive story once I become famous,” he told me, only half-jokingly. Like most Georgians seeking a life abroad, Irakli wanted to find work. Roughly 66,000 Georgians emigrate every year, according to Georgia’s National Statistics Service, and poverty is the main driver. But Irakli also had a point to prove to his friends and family – he lives with his retired parents – who exhort him to get “a real job” and get married, and say that music has gotten him nowhere. The style of music he plays is not particularly popular in Georgia, but he is convinced it would be a different story in New York. His American dream is an assemblage of Hollywood movie clichés: He is performing at a dimly lit bar in Manhattan to an enraptured audience; he dismisses the ovations with a humble gesture; a big-wig impresario comes to meet him backstage and slips him his business card. “Then I go up to the bar owner [an imaginary antagonist unappreciative of his talent] and I say, [switching to English] ‘I quit,’” Irakli said with a laugh and dramatic gesture. Irakli did spend some time “pushing papers,” in his words, as a clerical worker until he got laid off nearly a decade ago. Since then he has eked out a living giving music lessons and obsessing about his great American escape. He even developed the habit of saying “Madison Square Garden” as a regular non sequitur. He imitates an American accent when he does it and sometimes follows up with a conspiratorial wink. The first time he applied for a U.S. visa he was declined. He had borrowed $7,000 and put it in the bank as evidence of significant income, and got a letter of invitation from a school friend who had emigrated to the U.S. via the green card lottery and is now an American citizen. But the consular officer told him that as an unemployed person he was a high risk for overstaying the visa, which is in fact exactly what he had been planning to do. But he didn’t give up and late last year, he went to see Marina, the visa fixer. I tagged along as a friend and sat silently through their conversation. Marina runs her “travel agency” from a dingy old apartment in Tbilisi, but claims that her reach is global. “I can get you to any part of the world, boys. Canada? Brazil? Anything, if you have the cash,” she said, staring at computer a screen, a slim cigarette tucked into the corner of her mouth. Of large frame and a corresponding bearing, Marina is an intimidating presence. A plush coiffure of raven-black hair, a flowing silk robe with Japanese ornaments, cat-eye make-up and fierce lipstick give her an air of a 19th-century fictional villainess. Constantly griping about the world of incompetence that surrounds her, she dispenses orders and insults at a small team of tiptoeing assistants. The U.S. Embassy says that having a record of visa refusal does not automatically result in a denial, but it does make it harder for applicants to make their case with the consular officer in subsequent attempts. Marina’s main concern was that she would have to give most of her fee back to Irakli should the Embassy decline his application. Some outbursts later, though, she agreed to take up Irakli’s case and laid out her plan. First, he had to make a couple of trips to European Union countries to build a travel history: “They [the U.S. Embassy] need to see that you are not desperate to get out of here.” She suggested a few off-season trips to the Czech Republic, Greece or Italy, and insisted that Irakli did it through above-board travel agencies. Last year, the EU abolished short-term travel visas for Georgians, significantly easing travel to Europe but also leading to an uptick of Georgian visitors overstaying the allowed period and seeking asylum in the EU. As far as hosting Georgian asylum-seekers, the U.S. comes in fifth after Germany, France, Sweden, and Greece, according to data from the International Organization for Migration. The EU visa liberalization took away one source of income for visa fixers. But it also made their job easier: They send their clients to EU countries, which later helps them pass as legitimate tourists to the U.S. But a travel history alone would not suffice, Marina said. The next step was to get a job and a wife with a decent salary and travel experience. Marina would provide both. Irakli told me later that the woman Marina recruited for the job was in fact married with kids. “When a couple present themselves for an interview and claim to be married, the consular officer will ask questions about the relationship. If the consular officer does not find the answers to be convincing, the application may be referred to our Fraud Prevention Unit for additional examination,” said Rebert, the American consular officer. That unit carries out follow-up checks to verify the credibility of the alleged relationship. Still, Marina claimed in the conversation with Irakli that the trick with fake spouses often works. He scraped together the cash, borrowing both from friends and one of Tbilisi’s many loan sharks. Some of his buddies were not expecting to see their money back, but were kind enough to humor their old friend’s big project. “Just send us free tickets to your concert in New York,” joked one of his friends at a get-together at Irakli’s place. “Madison Square Garden,” Irakli specified. Six months later, after traveling to the EU on two short trips, Irakli was standing at the U.S. consular window. He had lost his usual ripped jeans, bright shirt and sneakers in favor of a suit and tie, and had shaved off his hipster beard. He still had the smile, though. When I went to see him after the interview, Irakli was keeping a brave face and, as is his wont, was keen to chat about his experience in great detail. He has switched his focus toward the EU as more feasible alternative to the U.S. for jumpstarting his musical career. “It’s closer and easier to visit, and if I become a successful performer there, then I won’t have trouble getting to the U.S.,” he said. To convince me, or perhaps himself, that he was destined for greatness, he cited several examples of the struggles various famous artistes had gone through before making it. The only thing that really did seem to get him down: the idea of visiting Marina to ask for his money back.